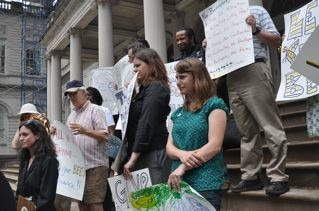 Just after lunch today, thanks to the busy bees over at Just Food, a swarm of advocates (including me and my stepdaughter) descended upon the steps of City Hall for a "bee rally" and press conference. 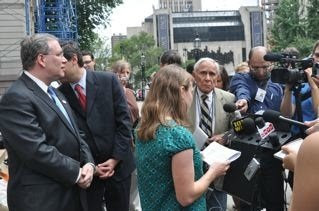 There was no shortage of media (or locavores) there to find out more about legalizing beekeeping in New York City. 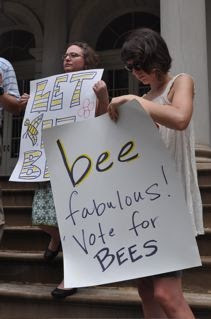 David Yassky, City Council member and speaker at the press conference, sponsored a bill earlier this year to legalize bee hives and call for a process whereby beekeepers are licensed and approved by the NYC Department of Health. He suggested that now that the budgeting process is done for the Council's Health Committee, that there may be some bandwidth for the committee to take on his beekeeping bill -- hopefully by the end of the month. He indicated that once people understand the benefits of beekeeping and how safe it is (provided, of course that the beekeeper knows what she is doing and is properly trained and licensed), that they're pretty much always for it. Scott Stringer, Manhattan Borough President and a leader in the city for local food and food access, and Jenifer Clapp, the food policy guru from Scott's office, joined Mr. Yassky and Just Food. Mr. Stringer (not STING-er as he jokingly said) has done a tremendous amount in the city in recent years to push forward a healthy food agenda and educate the public on such issues as "food deserts (not "desserts" he said), the need for farmers markets and fresh produce in low income neighborhoods, and tax incentives, zoning and land use policy to bring supermarkets into under served areas. And, now BEES which he sees as integral to growing fruits and vegetables in the city! 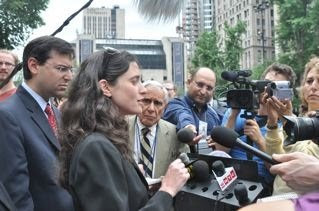 When challenged by the a member of the media about the safety of bees to bee allergic children, Jacquie Berger of Just Food cited some facts "a lot more children are allergic to peanuts than they are to bees" and underscored the docile nature of the honey bee versus say a wasp or other stinging insect. She added "but of course if you disrupt their hive that's a different story". 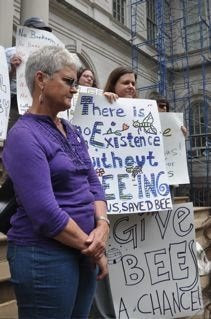 Some of the supporters moved over to a New York City Department of Health office on John Street where a hearing was starting regarding a summons in the amount of $2000 that was issued to an (ex)beekeeper last month for having a hive in her backyard in Brooklyn. Long after the press conference was over, City Hall was still a buzz with reporters interviewing experts and advocates on beekeeping. Tired from all the fun at Just Food's amazing Beekeepers Ball, Camille and I went home. Great Job, Nadia. Great Job Jacquie. Just stumbled across your blog. Love it. 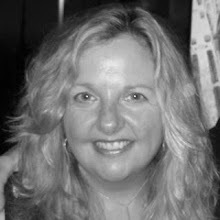 Have you had a look at www.ooooby.org yet? Lots of people there who would appreciate what you have to say. Over 1000 food gardeners and locavores networking together.